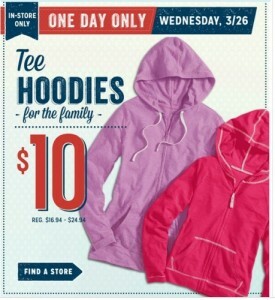 Visit your local Old Navy today to score $10 Tee Hoodies today (3/26) only. These are great to have for camping trips even throughout the summer. Plus you can earn $10 when you spend $25 with Old Navy’s Super Cash promotion, valid through 4/20. 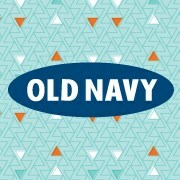 Old Navy cardholders can “Like” Old Navy on Facebook to get this new $15 off your $50 purchase coupon too! Today you can visit your local Old Navy and pick up kids jeans for $8 (reg. $19.50)! 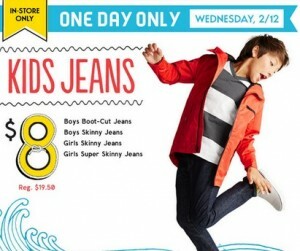 You can choose from boys and girls skinny and boot cut jeans. Hurry though, this sale is valid in-store today (2/12) only. Winter Warmers Old Navy Sale – Hats $1 + More! 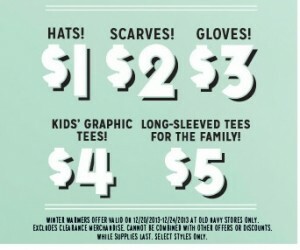 Visit Old Navy to score some new hats for $1 or gloves for $3 during their Winter Warmers sale! This sale lasts through Tuesday (12/24). Plus – before you head in to your local Old Navy be sure to “Like” Old Navy on Facebook to grab this $15 off $50 or $40 off $100 purchase coupon to save even more as you finish up your shopping!